Coloured map of Middlesex from John Speed’s “Theatre of the Empire of Great Britain”. 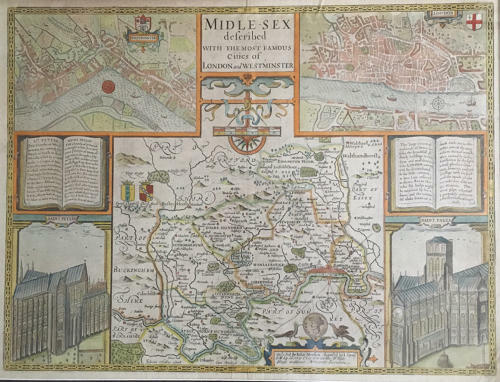 Considered to be the most decorative map of the county, it includes views of St. Peter’s (Westminster Abbey) and St. Paul’s cathedrals with brief notes on each contained on the open pages of two books. At the top of the map on either side, there are inset plans of London and Westminster and two coats of arms. The map is presented framed and is in very good condition.